Optimal working dilutions should be determined experimentally by the investigator. Suggested starting dilutions are as follows: WB (1:500-1:2000), IHC-P (1:100-1:300), ELISA (1:40000). Not yet tested in other applications. Fig.1. 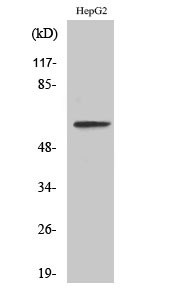 Western Blot analysis of various cells using IL-20Rα Polyclonal Antibody. Fig.2. Western Blot analysis of LOVO cells using IL-20Rα Polyclonal Antibody. IL20RA encodes a member of the type II cytokine receptor family. Interleukin-20 receptor subunit alpha is a subunit of the receptor for interleukin 20, a cytokine that may be involved in epidermal function. The interleukin 20 receptor is a heterodimeric complex consisting of the encoded protein and interleukin 20 receptor beta. This gene and interleukin 20 receptor beta are highly expressed in skin, and are upregulated in psoriasis. Alternative splicing results in multiple transcript variants. IL-20Rα Polyclonal Antibody detects endogenous levels of IL-20Rα protein.